What are user defined functions? What are the advantages of user defined function. Functions are blocks of codes to perform specific tasks and return the result. However it is not mandatory for a function return anything and also a function is not limited to performing one task only. 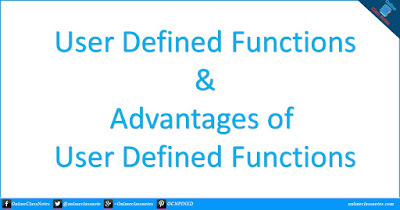 User defined functions are basic building blocks of a program and can be found in the basic structure of C program. Functions can be classified into two categories, namely, library functions and user-defined functions. The functions which are developed by user at the time of writing a program are called user defined functions. Thus, user defined functions are functions developed by user. Here addNumbers() is an user defined function. //defining an user defined function which has been declared earlier. Read More: What are the elements of user defined functions? It facilitates top-down modular programming. In this programming style, the high level logic of the overall problem is solved first while the details of each lower-level function are addressed later. The length of a source program can be reduced by using functions at appropriate places. It is easy to locate and isolate a faulty function for further investigations. A function may be used by many other programs. This means that a programmer can build on what others have already done, instead of starting all over again from scratch.